Thanks to Dr. Hayam Abdel Samie Aiad, Menoufiya University, Egypt for contributing this case. To contribute a Case of the Week, follow the guidelines on our Case of the Week page. CancerTYPE ID is a standardized, objective molecular test based on the differential expression of 92 genes, that classifies tumors by matching the gene expression pattern of a patient�s tumor tissue to a database of known tumor types and histological subtypes. CancerTYPE ID�s database includes 2,206 tumors from multiple tumor banks, selected to provide broader and deeper representation of the heterogeneity of tumors. 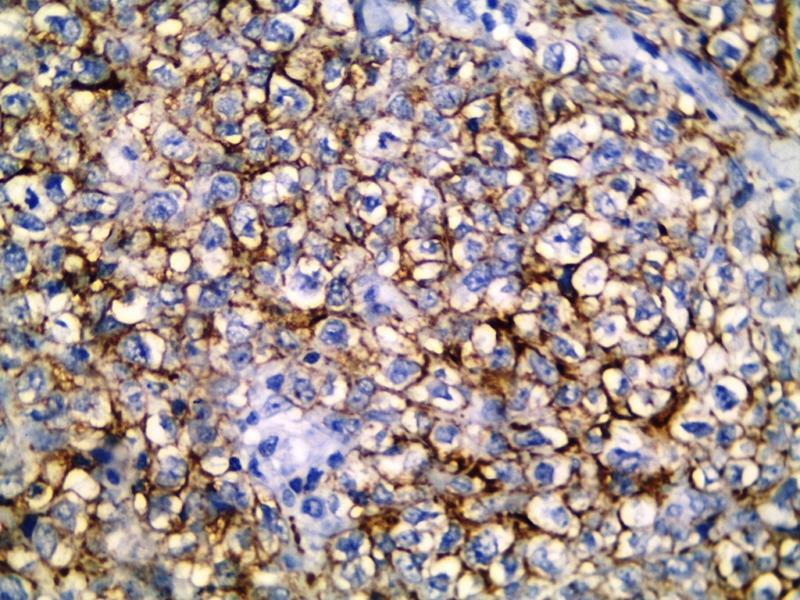 The 92-gene assay does not overlap with IHC markers, providing complementary data to standard tumor diagnosis. CancerTYPE ID uses real-time reverse transcription polymerase chain reaction (RT-PCR). A very low copy number of RNA molecules can be detected, thus reducing the sample tissue required for testing. Testing is conducted and results are generated at bioTheranostics' CAP-accredited, CLIA-certified laboratory. (1) Thanks to all who stopped by our booth at CAP '11. These are the projects we are working on: (a) finish the Home Page Topic search by October 31, 2011; (b) more frequent reviews / updates of topics (ongoing); (c) new format for viewing website on iPad or Smartphones (starting to plan); (d) possibly more interesting social media discussions. Let us know what you think. (2) Thanks to Dr. Perry Cohen, Montefiore Medical Center of the Albert Einstein College of Medicine, for his suggestion to post Cases of the Week by Category without a diagnosis, which has now been done. (3) We posted an article on our Management Page, How to Gain a Better Managed Care Contract for your Independent Laboratory, by Mick Raich, Vachette Pathology, click here. 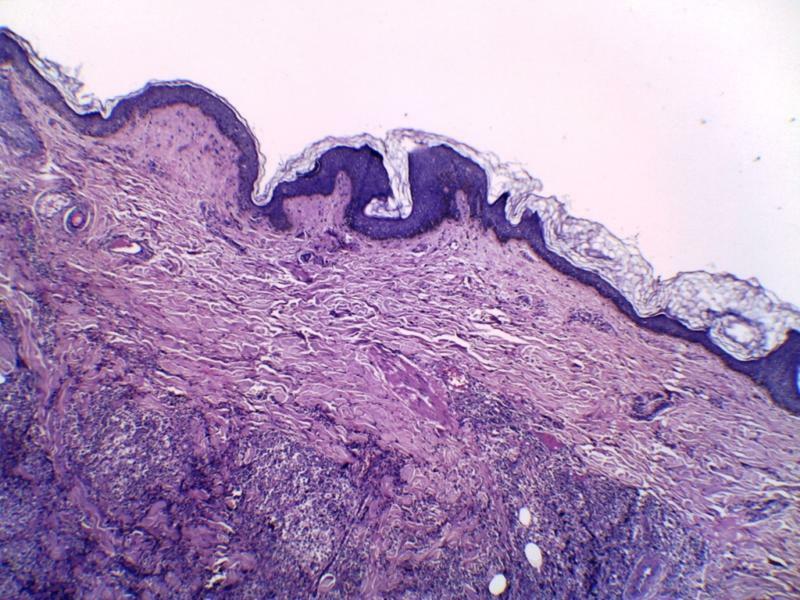 A 55 year old woman had a two month history of a fungating axillary tail mass, which was fixed to the skin. At excision, it was 14 x 13 cm. Primary and secondary breast lymphoma are rare, each representing less than 1% of all breast malignancies. The criteria for primary breast lymphoma are: (a) sufficient tissue for diagnosis; (b) close interaction between the lymphoma infiltrate and breast tissue; (c) no evidence of widespread lymphoma at time of diagnosis; and (d) no prior diagnosis of nonbreast lymphoma (Cancer 1972;29:1705). Diffuse large B cell lymphoma is the most common subtype of primary breast lymphoma (Am J Hematol 2009;84:133). 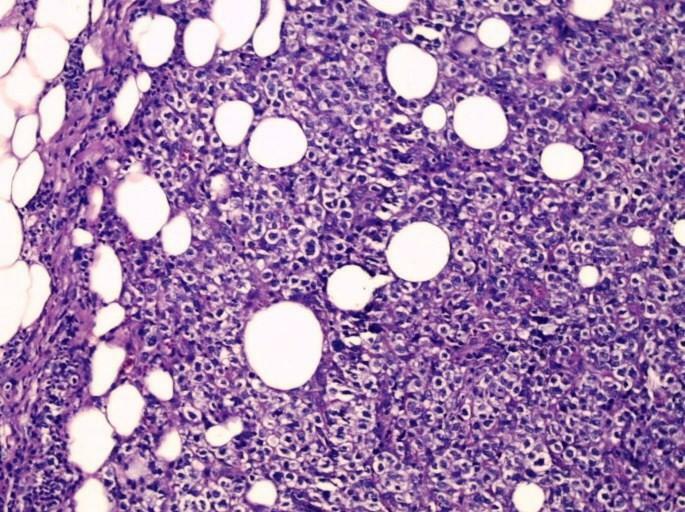 Clear cell change has been frequently described in mediastinal diffuse large B cell lymphomas (Blood 1987;69:1087, Virchows Arch A Pathol Anat Histopathol 1986;409:79), but not in the breast. 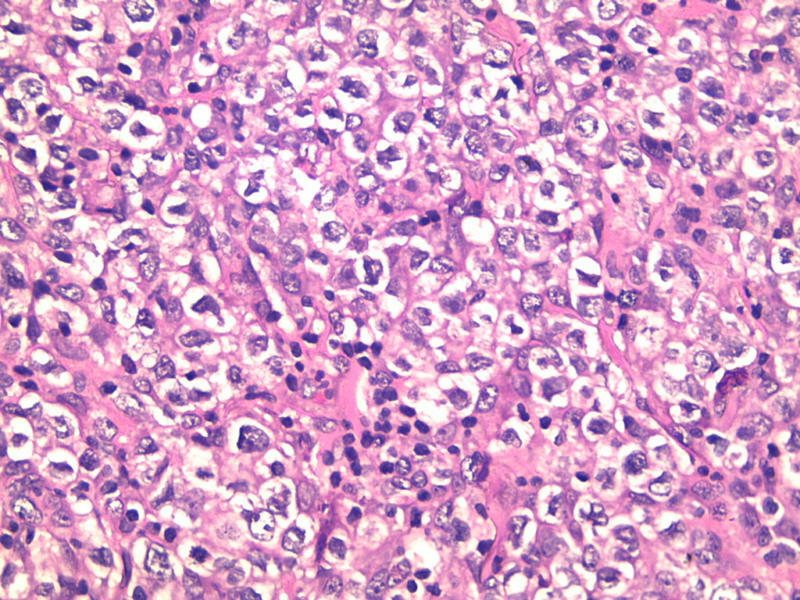 Clear cell lymphomas have diffuse sheets and groups of malignant cells with clear vacuolated cytoplasm. The nuclei are pleomorphic, indented and vesicular. There often is necrosis and a high mitotic count. 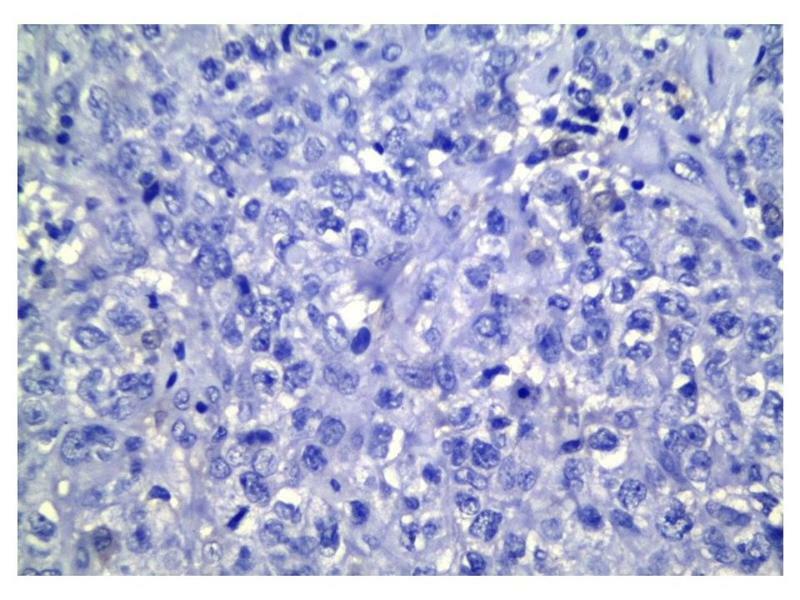 Other primary breast tumors with clear cell changes include glycogen-rich carcinoma and some myoepithelial carcinomas. 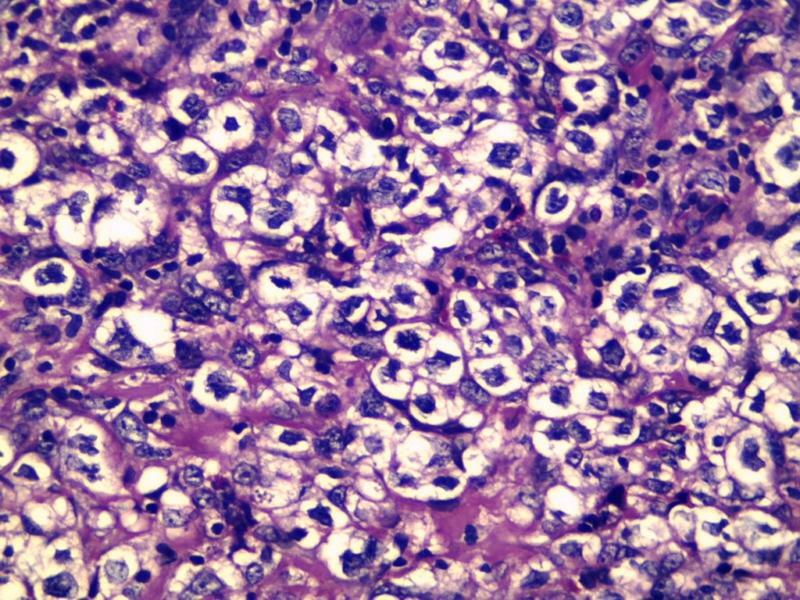 Metastatic tumors that should be considered in the differential diagnosis include perivascular epithelioid cell tumors and clear cell carcinomas from the kidney, ovary and lung. Treatment consists of radiation therapy, chemotherapy and Rituximab (anti-CD20 antibody). Tumors with a non germinal center phenotype are more common, and genotype appears to not influence prognosis (Am J Clin Oncol 2011 Feb 15 [Epub ahead of print], but see Leuk Res 2008;32:1837).